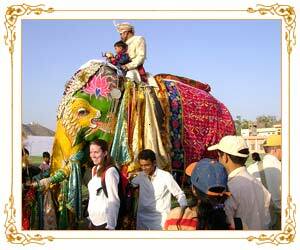 Have You Ever Been to Elephant Festival in Jaipur, India…!!! Ever thought of the majestic elephant as a canvas? Come down to Jaipur during the elephant fest. Decorated in paints and colorful livery, actually the female elephants get to wear anklets that jingle, they look as bit majestic as in the days of yore when Rajput pride shone bright in Rajasthan. The festival started the Holi festivities. It used to be held at the Chaugan stadium near the Hawa Mahal. The elephants walk through the Old City and usually start out from Ravindra Manch. So you might accompany them but do remember entry is free so arrive before the usual 4 pm start. As for the mundane events after the elephants reach the venue – well they include Elephant ‘beauty’ contests, Elephant polo, Elephant race, the tug-of-war between Elephant and 19 men and women – need I tell you who wins – every time? And yes I almost forgot this year onwards it will be held at the Jaipur Polo Grounds. On menu this year are: Gaj Shringar’ exhibition, traditional elephant procession, gair dance, elephant decoration competition, Chang Dhap folk dance, Matka Race for tourists, a tug of war event between domestic and foreign tourists, Braj Holi folk dance and the playing of holi colours on elephants. Then rows of elephants will walk the ramp followed by band recitals and concluding the evening with a display of soundless fireworks. In 2011, ‘Elephant Festival’ will be celebrated in Jaipur on 19th March… Are you there …!! Toshali Resorts International invites all Fans, friends, guests to celebrate “Elephant Festival” at Jaipur, India…. For booking and accomodation reservation for weekend tour http://bit.ly/fDm2fW . You can also contact your Travel Manager ‘Metu’ for more details at metu@toshali.in and booking@toshalitours.com .. Share this information with your friends at facebook and other social networking sites..